Home / Lakewood Ranch Plumber / Saturday Afternoon Plumbing Nightmare. You woke up Saturday morning feeling great! Your spouse has a honey-do list for you. Being the terrific spouse you are, the list starts getting done. One by one, you are fixing all the little or big things on the list. By the time you get down to the “fix leaking shower”, it is around 4;00. Your thinking, this will be a breeze. You find out that you will need to shut off the water to the whole house because there are no shut-off valves behind your shower. Okay, not a problem. You turn off the water to the house. Now you go inside and take apart your shower valve. You remove the shower cartridge with the trusty tool that the hardware store guy sold you, but find out it only pulled the inner part of your cartridge out and left the rest of the cartridge in the valve. Oh, Oh. Your breeze job just became a nightmare. Now what are you going to do? The hardware store guy didn’t tell you about this, did he? Your spouse comes in to check on your progress or hears you swearing and wants to know when you are going to turn the water back on. You don’t know, because there is a piece of the cartridge stuck in the valve. And unless you get it out, the new cartridge won’t go in and the water to the house can not be turned back on. You have friends coming over in a little while, and your little plumbing job has turned into a total nightmare. 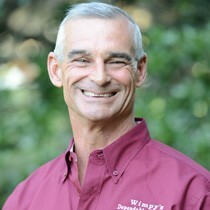 You should call Wimpy’s Dependable Plumbing. We will try to walk you though the process of fixing it over the phone, or tell you if a special tool is required for whatever has happened. You are not the first person this has happened to. With today’s shower valves, some are very intricate, some are simple. Some require special tools to disassemble or to remove broken parts, that are only available at a Plumbing wholesale house. The safest thing to do with items on your honey-do list that involve plumbing is to call a Florida State Certified Master Plumber, such as Wimpy’s Dependable Plumbing. We serve the Lakewood Ranch, Sarasota, Bradenton areas, including Longboat Key, Casey Key, and the Old Miakka Communities. All of our plumbing trucks carry the special tools needed to end your plumbing nightmare. We want your spouse to love you and we want you to Love Your Plumber.